After more than three years of research and development, Heinz thinks its new ketchup packet is finally ready for primetime. Wendy's will swap out the traditional rectangular ketchup packets later this year and smaller chains like Chick-fil-A, Smashburger, and Dairy Queen have already made the switch. McDonalds and Burger King are testing the new packet, but have not made any plans to change yet. While the packets may seem like a trivial point of eating out at one of these restaurants, they contribute to the margins restaurants make since the ketchup is "given away" for free. 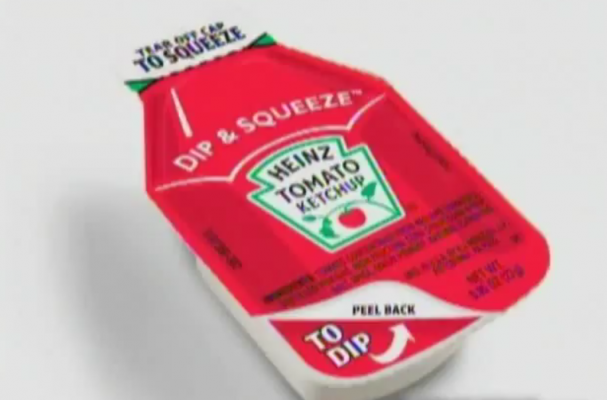 These new "Dip and Squeeze" packets will allow customers to squeeze ketchup from the top onto sandwiches, while also enabling them to dip french fries into the bottom. The new packets carry three times as much ketchup as the previous packets. In order to create the new packets, "staffers sat behind one-way, mirrored glass, watching consumers in 20 fake minivan interiors putting ketchup on fries, burgers, and chicken nuggets," according to the Wall Street Journal. Early reviews are mixed. Chick-fil-A reports that customers have been taking more ketchup with the new packaging, while Smashburger and Dairy Queen report the opposite. Customers reportedly prefer the new design. Whataburger, a hamburger chain that is located in the South, has been using similar ketchup packets for many years. That is just one more reason I like Whataburger. Whataburger...lol...i thought i was the only one who knew whata great place that is. didnt know there were still any around! The real question is, how much more landfill space do these things take up? Well, all I can say, is it's about time! Hope they do the same for my favorite ....mustard. Very good They look much more user friendly. Excellent!!!! They look so much easier to dip my french fries into!!!!! If they are easier to open, and the spillage is less, then I am hoping that they are better. I like the concept, but the proof is always in the using of the product with the clumsiest of all customers!